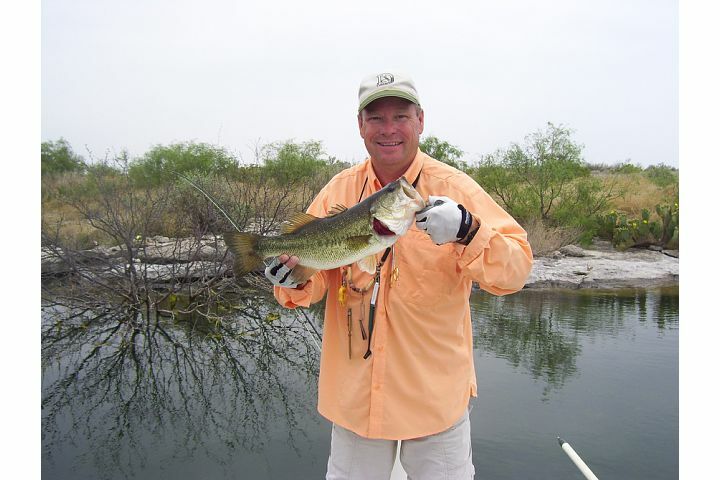 Cody often states that fishing North Texas lakes is difficult for him. Then, he tells me all about Lake Amistad, an often occurring Bell family vacation during his youth. Today, I christened my 4# rod with my beautiful, new copper Ross Reel outfitted from Tailwaters Fly Fishing Co. and Cody's newest version of fly named the Girlie Bugger. For those of you who know the Cody Bugger, the Girlie Bugger has a hot pink cone in place of the brass one and no lips. It caught fish; yes, it did, so did our amber Bonefish Bitter, our black with silver flash, short strike SMP, our Swamp Monster, and our pale Candy Striper--all of which we tied ourselves over the last 10 days. We saw caves and cliffs, swallows and were straffed by buzzards, turtles and Spanish goats, and sight-casted to fish. The lake's water level is really high, thus, Indian Springs is underwater; however, where it flows into the lake, the colors look like saltwater reef fishing--brilliant blues and greens. For the day, we caught Bluegill, Longear Sunfish, Largemouth and Smallmouth Bass; truly, a fine day at sea! We spent our time discovering, spelunking, and exploring. Beginning our day at Seminole Canyon State Park, we discovered tales of Pre-historic Man, Ranching, the Southern Pacific Line, and learned about the Canyon, itself. It definitely deserves our time as campers! We put in at the Pecos River boat launch, which was the original road crossing the Pecos in the 1970s. However, the road now lies under the river water levels, so the downslopes are all that remains. Cody said that people who lived west of the Pecos used to back their boats all the way down the road, so it served as a boat ramp as well--very menacing, and you had better be able to back a trailer, well! 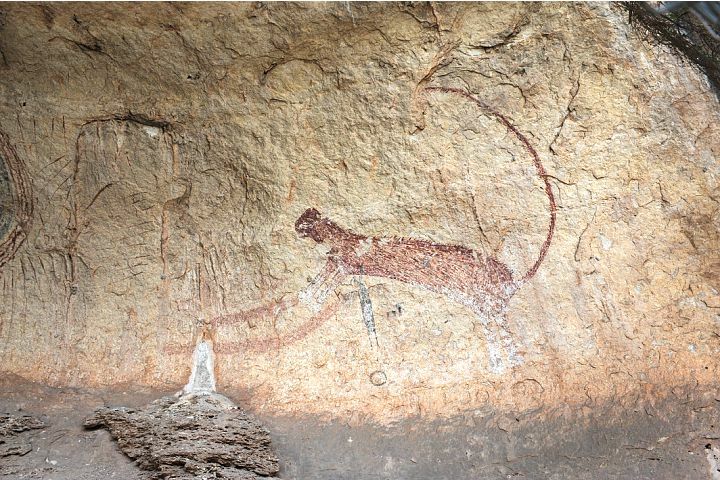 We toured Parida Cave, Panther Cave, the original train tunnel, which was so full of water, we couldn't navigate the boat through, and we hiked up and into the old water drain tunnel, discovering many fossils along the way. About 30 minutes was dedicated to fishing, of which we both had success--fishermen of the world, we are! After meeting Rankin friends, Joyce & Tommy Latham, Cody and I headed out to Box Canyon. Getting in the water was not a problem; finding a place to park the car & trailer was no easy task, what with the lot covered with at least 50 cars & trailers. Whew! Just to the west of the boat ramp was a cove that eyed Cody's interest, and off we went. Cody earned the title of the Flyrodding Bass Master this day. First cast, using a most buggy, crawfish pattern from Tailwaters, FishOn Cody Bell. Nice bass, too. Four casts later, bigger FishOn, measuring 18 inches and weighing 2 3/4 pounds. 10 ft. farther on and Mamma Bass is protecting her nest. Casting and dragging over her nest, Cody lands bass three having travelled 20 feet. Moving on to the point, Cody catches bass four and five. Meanwhile, I finally manage to catch a fish, a Redear Sunfish, species first for me; I feel somewhat relieved. Finding another Mamma Bass, she never took our flies. Remembering in the not too distant past, the bluegill from Thursday really enjoyed hammering our brown Bonefish Bitters, so on the end of my line it went. Finally, one of those guys harassing Mamma Bass, takes that circle hook Bitter, and I don't feel so inept, for now. Cody continues to fish with great success, and by 2 p.m., he's landed 12 bass. Nothing I'm throwing works, and taking pity on me, Cody pulls a second brown, swampy locust-looking fly, and I finally am getting nibbles, but no fish. Continuing with his sympathy, Cody allows me to choose the next spot, and Cow Creek looks fishy on the GPS, so off we go. At the bow, I'm running the trolling motor, and we are seeing some big carp over pristine grassbeds, but they are some skittish fish. Giving up on that spot, we move to some fishier structures, and not until we round the point and hitting 4 p.m., I finally hook-up. Cody Bell, of course, snaps a wonderful photo of that fish jumping. Relief sets in that I am not an inadequate caster/fisher. Cody steers the boat back into this narrow, shallow channel, and bluegill like the popper Cody has tied to his line. I have switched to my 4 wt. with the Girlie Bugger, and a 2 lb. Yellow Bullhead Catfish, takes that fly, and I have to fight to keep it out of the brush, out from under the boat, and in the water so it won't break my tip. With Cody's great help, we get that fish in the boat. 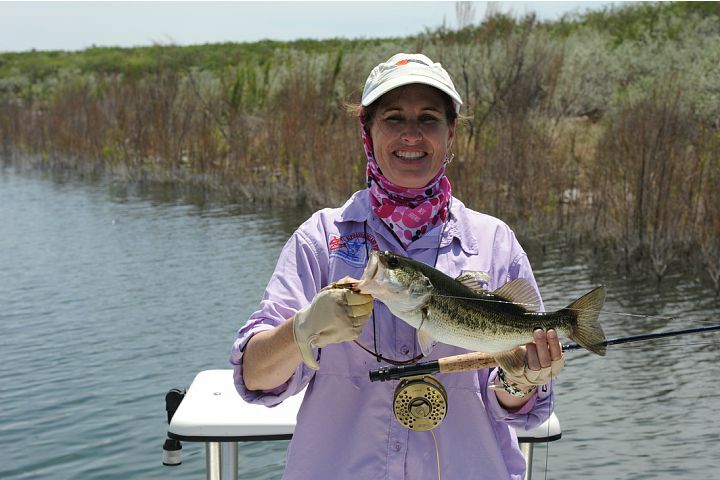 Fishing improves and we catch Bluegill and small Largemouth Bass. Heading back to Cody's original cove, we catch a few more fish and end the day with Cody catching 19 fish and me 9. Amazingly, at 9:05 p.m., we were the only car and trailer in the lot! Sunday, we checked out of our hotel, and head to Diablo East around 11 a.m. Fishing an attractive cove, we had very little action. Sight fishing to catfish, we only catch excitment. Cody decides to measure how deep the bottom is to where the catfish are. Using his pushpole, we can see where it touches the bottom at 20 feet! Cody plays guide and we tour the dam, and spotting a fishy cove, head in. Bass fish and bream love Cody's yellow popper. I had tied an olive marabou muddler, a first, and chose to fish it, much to a 1 3/4 lb. bass's delight. We ended the day with our only double of the trip--Cody has a bream and I a small bass. 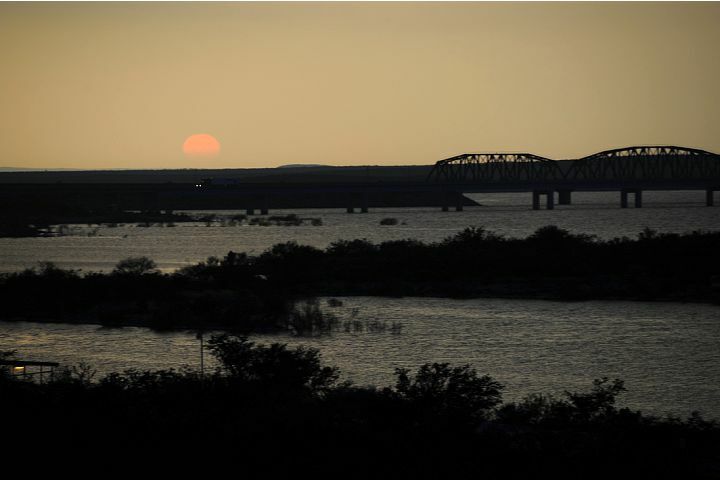 Lake Amistad has become a must, at least an annual event, if not a bi-annual event. Its crystal clear waters are going to make fishing North Texas lakes difficult, because sight-casting is a blast, but we won't give up, oh no!